I’m not a people person. If you’ve read my posts, this doesn’t come as a huge surprise. So living at Lake Tahoe during the more popular holidays, like July 4th, requires me to think creatively of ways to avoid said people…or leave town entirely. This year we chose the latter. We had been invited to a wedding in Salt Lake City, which we used as a reason to pack up the bikes and head east. 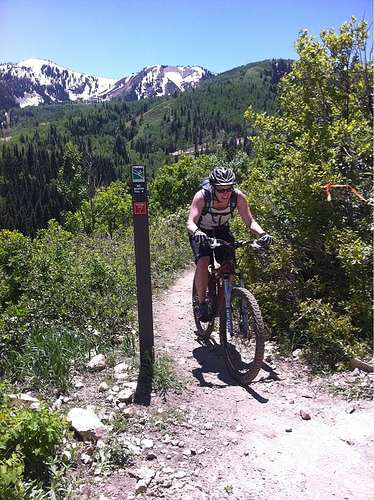 Our intention was to do some mountain biking, as we’d heard great things about the trail networks, and how you could ride 40+ miles in a day from Park City to Big Cottonwood Canyon. I’d seen enough photos of the trails in the Park City area to know that I wanted to try them. Aspen groves, buffed trails, swooping descents…it looked really different to what we have here. As with Tahoe, however, Utah also had a big winter, so the upper trails that connect the canyons to each other weren’t open. There was a long mid-mountain trail that had finally been cleared of snow, so we figured that taking it from Park City to The Canyons would be fun, and not as strenuous as, say, some of the longer rides we take at home. I'm smiling because I think the climbing is over. I neglected to factor in the heat (it was unusually warm that weekend) and my five degree comfort range. Suffice to say the climbing, which wasn’t technical nor terribly long, was painful. The descents were fabulous, but anything resembling an uphill resulted in me huffing and puffing in my granny gear. I’m not sure where the results of my single speed miles were, but they weren’t visible there. The scenery was a helpful distraction, especially the beautiful groves of aspens, lush meadows and many waterfalls. After a few hours, I was beginning to doubt the veracity of the map, for it seemed like we’d covered more miles than we had. First sign of heat exhaustion? Luckily, we found an oasis in the form of a restaurant at the top of a gondola at the Canyons. Never has an Arnold Palmer tasted so good. The healing powers of it and a beer helped me finish the ride, which included a super fun singletrack descent to the bottom of the ski resort. Look forward to doing it again. Preferably in cooler weather. Oh, and the wedding reception? Totally fun. It involved a working farmhouse, a country band that resembled the groom, a taco truck, and a bride in cowboy boots. Oh, and random fireworks set off by the neighbors.